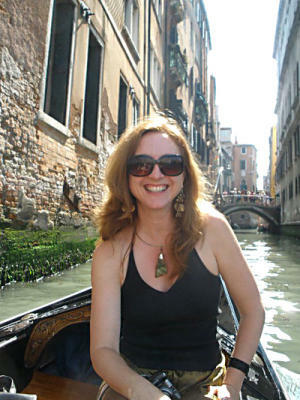 Welcome to my blog interview with writer, Kathleen Ann Gonzalez, author of A Beautiful Woman in Venice and Seductive Venice: In Casanova’s Footsteps. Kathleen Ann Gonzalez started out as a teacher but was surprised to discover that she is a writer and dancer as well. While she spends most of her time trying to infect teenagers with her great enthusiasm for literature and writing, she still squeezes in time to write about her work and her travels. Her first book, Free Gondola Ride, is about the gondoliers of Venice, while her second book, A Small Candle, includes interviews with participants in the Camp Everytown program. Her 2013 guidebook Seductive Venice: In Casanova’s Footsteps, takes readers to over 90 locations Casanova lived and loved, and it has been published in Italy as well. Gonzalez has published several other essays and articles over the years and has recently completed a book about Venetian women, titled A Beautiful Woman in Venice. Kathleen Ann Gonzalez’s curiosity about the mythical figure Casanova resulted in her new book “Seductive Venice: In Casanova’s Footsteps.” It is both a guide to Venice, which she visits annually, and an insight into the legendary lover. My first book, Free Gondola Ride, was born from my love of Venice. I fell in love with the city within the first five minutes that I was there, on a 1996 spring break trip with my students in Europe. I returned to the city that summer and met a gondolier who piqued my interest in his unique profession. Wondering how to get back to Venice again, I thought, “Why don’t I write a book about the gondoliers?” No one else had done it yet, and I thought I might as well try. I definitely doubted myself along the way, but since I had successfully published some essays and other articles, I decided that I should at least try. Free Gondola Ride was trying to be a couple genres—history, memoir, and travel book, which is perhaps its biggest weakness as its purpose isn’t so clear. I learned from writing that book that I should have a clearer concept of my purpose for the work. Not that a book has to fit neatly into a single box, but I do believe the writer should know what she’s trying to do. Seductive Venice is a guidebook that I tried to make accessible for armchair travelers as well as those on foot. My latest book about Venetian women is really a history book, with biographies about a host of historical women. I never knew I was going to become a historian.